As a dietary supplement, take 1 capsule daily and/or as specifically recommended by your health care practitioner. This product is available in a vegetable capsule that delivers 3 billion CFUs. 1. What is SCdophilus ? SCdophilus™ is an innovative probiotic designed to be used in conjunction with, and in support of, the Specific Carbohydrate Diet (SCD). 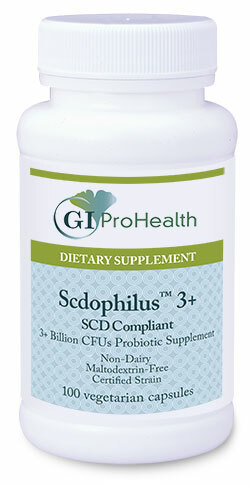 SCdophilus™ utilizes a well documented Lactobacillus acidophilus strain that is known to support intestinal health. The SCdophilus probiotic formula was developed by GI ProHealth™ to offer the utmost in purity, hypoallergenicity, stability and clinical efficacy. 3. Who should use SCdophilus™ ? 4. Is SCdophilus™ the same as Lactobacillus Acidophilus ? 6. Is SCdophilus™ dairy free ? Yes , SCdophilus™ is a certified dairy free product. 7. Is SCdophilus™ SCD legal ? 10. How long will SCdophilus™ keep in my refrigerator? Usually expiration date is 6 months from date of purchase. 11. Does SCdophilus™ have to be refrigerated? 12. Can SCdophilus™ be mixed with food or drinks. I am so grateful for this product. I waited 2 years of being on SCD diet to finally get probiotics because I didn’t think it would make much of a difference because I was making my SCD yogurt, but I feel great and wish I would have done it sooner! Thank you so much! My baby has reflux since 4 months old, he is now 16 months. Doctors thought he would outgrow it once he turned 12 months. Not wanting to keep him on medicine we looked into probiotics but none helped or made things worse due to ingrediants. He does so well on this hypoallergenic probiotic. Thank you GiProHealth ! I have tried many probiotics, but when I read about this line, I thought it made sense to try these because they are lactose and casein free, which are a major part of my gut issues (milk products). After taking these less that a week at night before bed, I have had fewer and fewer problems and can actually feel comfortable eating the foods I enjoy. I just reordered and will continue to use this product. One thing to consider, when ordering it is very expensive to ship this due to the ice needed to keep the product cool. When I ordered the first time, I ordered with ice, but apparently not enough as the ice was melted. This time I ordered priority with ice for over 90 degree temperatures and hope this will still be frozen by the time it gets here.